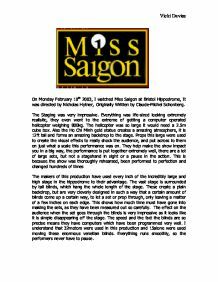 Miss Saigon - a critical review. 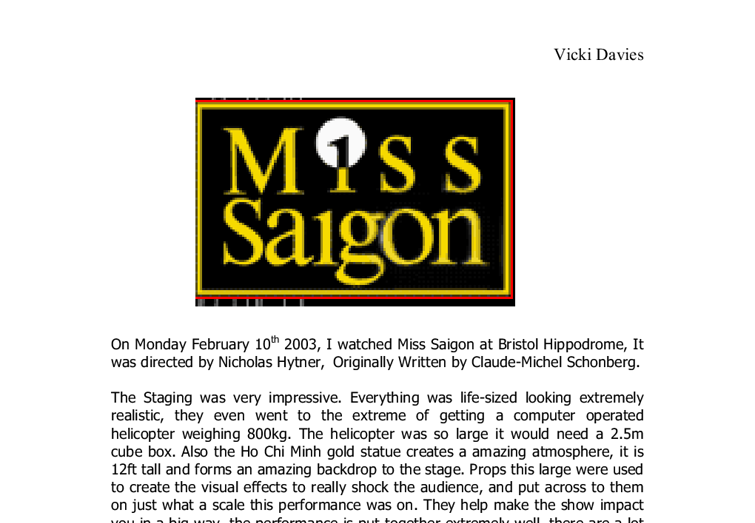 On Monday February 10th 2003, I watched Miss Saigon at Bristol Hippodrome, It was directed by Nicholas Hytner, Originally Written by Claude-Michel Schonberg. The Staging was very impressive. Everything was life-sized looking extremely realistic, they even went to the extreme of getting a computer operated helicopter weighing 800kg. The helicopter was so large it would need a 2.5m cube box. Also the Ho Chi Minh gold statue creates a amazing atmosphere, it is 12ft tall and forms an amazing backdrop to the stage. Props this large were used to create the visual effects to really shock the audience, and put across to them on just what a scale this performance was on. They help make the show impact you in a big way, the performance is put together extremely well, there are a lot of large sets, but not a stagehand in sight or a pause in the action. This is because the show was thoroughly rehearsed, been performed to perfection and changed hundreds of times The makers of this production have used every inch of the incredibly large and high stage in the hippodrome to their advantage. ...read more. The choreography was often very elegant, and moved the audience greatly. A section of the performance that impressed me was when all the actors who were on stage were dancing, they all produced sticks with a strip of red silk on the end, all performers knew which way to wave it and what patterns to make. The final effect on the audience looking down on this was extremely impressive, all the red strips making the same patterns 20times over on the stage. Members of the cast know exactly what they are doing at each part of the performance, no actor ever went out of character, and each actor's body language benefited and fitted in with the scene that was happening on stage. Even if it was a crowd scene, the audience could never pick out a specific actor and wonder why he or she was doing what they were. For example, The red light district, each sexual dancer had a small stage, and were dancing to a group of men, these people were moving around hurriedly, observing each one. ...read more. Each room was very well decorated and designed, None of the effects used would have looked half as impressive without the stunning lighting effects that were used throughout this production. Each performance uses 6 follow-spots, 20 vari-lights, 30 moving light curtains, 8 fog and smoke machines, and 135 kilos of dry ice. The lighting effects helped to create the general overall atmosphere of the scene, this was done very effectively and accurately. In the opening scene, the 8 girls were all sitting in a crowd at very different parts of the stage singing in the near darkness, 8 spotlights very cleverly switched on find the exact points of the girls faces without moving toward them. I thought this was very clever. Particularly as just before this elegant, moving part, was a very high-energy scene in the bar. I thought the two effects contrasted each other very well. I think this production of Miss Saigon combines all the visual effects needed to make an unforgettable performance, that most people will see again and again. As 28million people have seen the show now, it is unlikely the show will fail. Vicki Davies ...read more. More things, such as the aggressive, physical theatre, reinforce this. * Military style anthem begins. Heavy beat, grand but severe. Similar to above. Impressive and interesting, but intimidating and serious. * Huge gold statue of HoChi Minh is wheeled forward to upstage centre, sense that he is looking over his people. 'how for will you go for me?' or 'for how long will you stand by my side?' so it seems like he one was testing his friends loyalty. I personally found this extremely interesting because they use their language to tell a story which made me think and kept focus on what was happening. Jean remarks that she needs to wash her face ==> Julie again begs Jean to join her, fearing the memories that will haunt her on her journey. Jean agrees. When Miss Julie moves to bring her canary, Jean insists that she leave it behind. After a few more similar accidents Peter eventually decides that enough is enough and drops his heroic alter ego altogether and lead a normal life like everyone else. But Peter slowly comes to realize that the city needs Spider-Man, not just to prevent crime, but to provide the hope of saviour to those who need his help. To do this I would lower the tone of my voice in a 'mooing' connotation although as our piece progressed the animal symbolism grew out as it did not really fit in with the rest of our piece. We went to several performances throughout the course as part of our research into what was effective to the audience. When Mickey was depressed, Sean presented him clearly and effectively. He showed Mickey was depressed by slowing his voice and making it seem slightly slurred. Even though his voice was quite slurred he still kept it loud and understandable. Sean also showed anger by shouting and steeping forward in a threatening way.